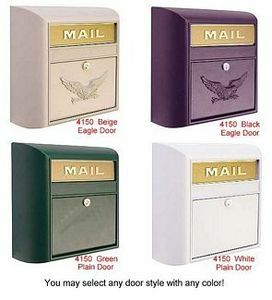 The 4150 surface mounted modern mailboxes are made of cast aluminum and have the word "MAIL”" cast into a 10" W x 2-1/2 " H. solid brass mail flap. Units are accessed through a locking door and include a lock with two (2) keys. Each model features a durable powder coated finish available in four contemporary colors and in two attractive door designs. A non locking thumb latch (related item #4188) is available as an option upon request. Modern mailboxes may be used for U.S.P.S. residential door mail delivery. Master postal lock not required.